* HaDiyun HaKlali B'Yeshivot HaVaadah [The General Deliberation in the Council's Meetings] - Provisional State Council/ Vaadat HaChukah [Constitutional Committee], booklet 1. [11/8/1948-18/8/1948]. * Im Megillat HaAtzmaut shel Medinat Yisrael [With the Declaration of Independence of the State of Israel] by Alex Bein, published by the Youth and HeChalutz Department of the Zionist Organization. Jerusalem, 1949. 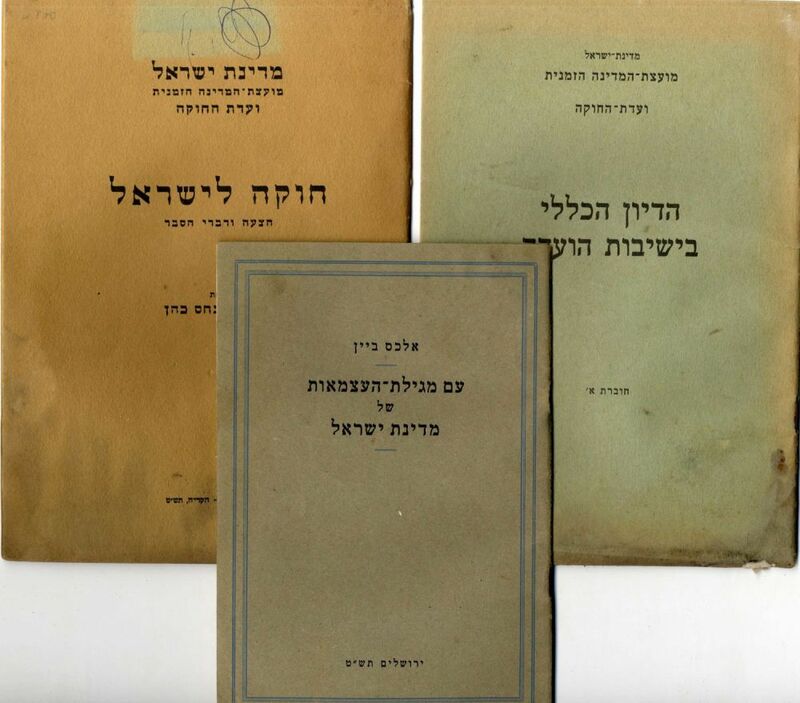 * Chukah L'Yisrael [A Constitution for Israel] - proposal and explanation by Yehudah Pinchas Kohen - Moetzet HaMedinah [State Committee], HaKiryah, 1949.